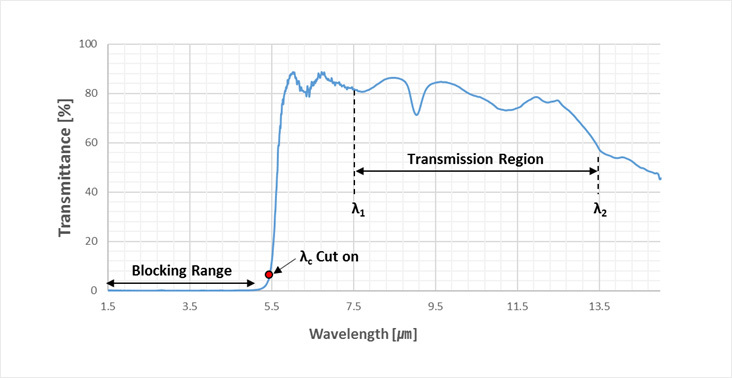 Infrared Long wave pass filters are designed to transmit wavelength longer than their specified 5% cut-on wavelength and to block shorter wavelength than their specified 5% cuton wavelength. Infrared Long Wave Pass Filter and Infrared Wide Band Pass Filters are commonly used for Motion and Intrusion sensor. The filters are designed with the specification of less than 0.1% in average and Less than 1% in absolute for blocking in order to minimize noise. The filters can come in different sizes based on customer's requirements. Industrial temperature measurement, Continuous temperature control for manufacturing, Security system, Radiation monitor. Most of Blocking at range under 5um wavelength in order to reduce the noise, High transmittance at range 7.5~14um wavelength in order to make higher sensitivity of the sensor.